How about a new twist on TWO old favorites? 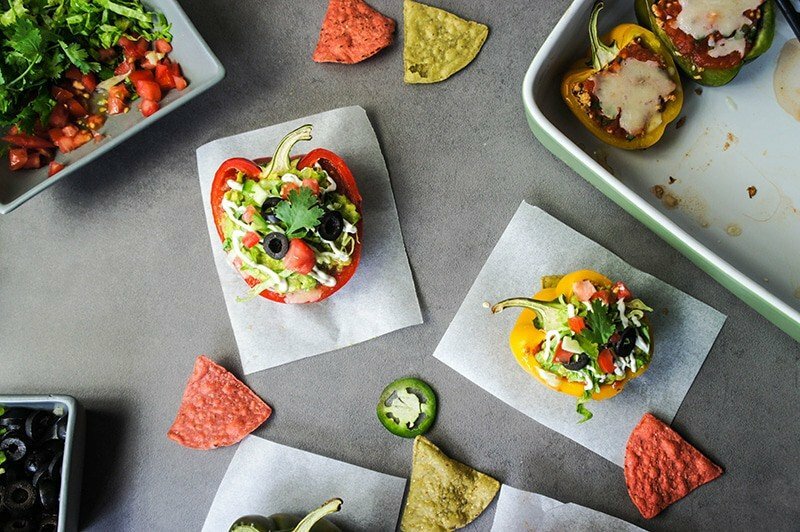 7 Layer Dip + Stuffed Bell Peppers collide in this summery dish. I’ve been seeing photos of 7 Layer Dip float around the internet this summer, and have really been wanting to make it! I decided if I was going to make it, I was going to flip it on it’s head- make the vegetables the star, and use chips as a garnish. I would never suggest forgoing the chips altogether. I love tortilla chips. As long as they aren’t the main component of your meal (and you buy a quality brand), they are perfectly healthy as well. Knowing that I’m going back to work soon, and won’t be able to take photos mid day very often anymore, I’ve been trying to back stock recipes and photos to make running the blog during the school year a little less stressful. Last weekend, I was so proud of myself. I planned out a dinner for each night, plus a few snack/breakfast options, that I wanted to photograph for the blog, and went to the store, sticking to my list, making sure I was prepared for a week’s worth of delicious meals. I got home from the store, and Alex told me he was going to need to travel for work, and he was going to be gone ALL week. When he’s gone, I’m the ultimate lazy meal preparer. I eat yogurt sundaes, green smoothies, and protein pancakes for dinner. Mentioning this to a friend, she generously offered to come to lunch and help me take care of that problem 🙂 She is also a teacher, and our schools have different holiday schedules, so it was wonderful actually getting to hang out with her during the day. Our summer holidays only overlap by 2 weeks! I wish I could say I made all the meals anyway, and treated myself to healthy, fresh meals all week. Nope. Yogurt sundaes it was! And unfortunately, my trash can got filled with moldy cauliflower, slimy peppers, and gooey pumpkin. I hate it when that happens– and I really should have been more proactive and done something with those vegetables that I could freeze. These 7 Layer Dip Stuffed Bell Peppers ended up being meals for 3 days for me, and I wasn’t inspired to cook for myself much beyond that. Thank goodness my wonderful friend at least got me to put these together! I’ve been wanting to try Pioneer Woman’s Restaurant Style Salsa that everyone raves about. I actually did try it a while back, but since I couldn’t find Rotel tomatoes and green chilis in Kuala Lumpur, my salsa ended up… not so good. While shopping at BIG last weekend, I found Rotel tomatoes! I finally tried her recipe with the actual ingredients she calls for, and got to see for myself why her salsa has such a good reputation. Ah-May-Zing. So much better than the Pace salsa available here! Try it for yourself in this recipe- or save yourself some time if you can buy a good prepared salsa. I would, if I had ONE MILLION options at Whole Foods. This week, I have the opposite problem. It’s Hari Raya (the end of Ramadan), the biggest holiday of the year in Malaysia. I went with my carefully prepared list to the grocery store yesterday, and it was closed! It opened later in the day, but I didn’t make my way back over there. 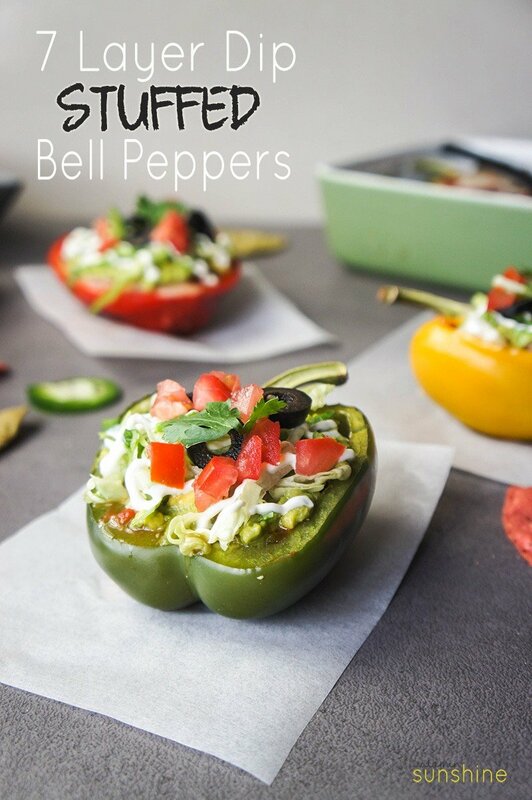 Two classic dishes- 7 Layer Dip & Stuffed Bell Peppers- collide in this summery dish. Preheat over to 425º f.
Cut bell peppers in half and remove the seeds, scraping out the veins. 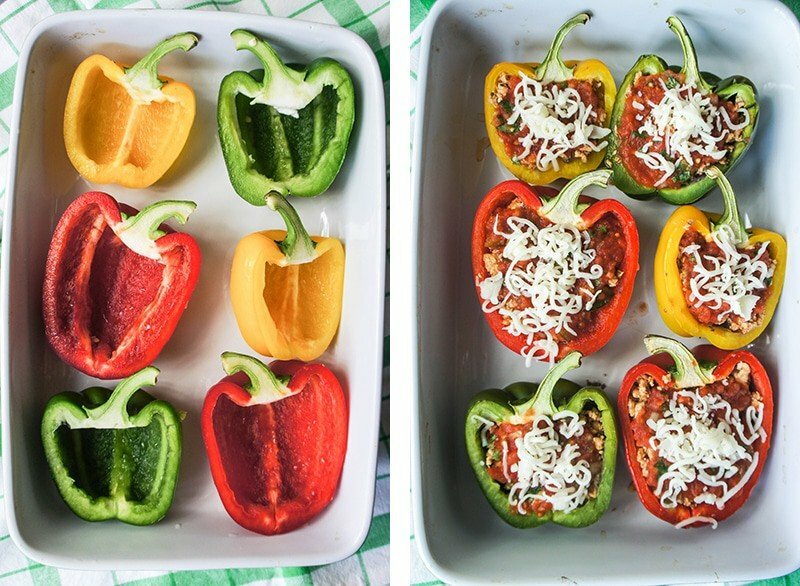 Put the bell peppers in a baking dish, and sprinkle lightly with sea salt. Cover tightly with foil, and bake the peppers for 20 minutes. 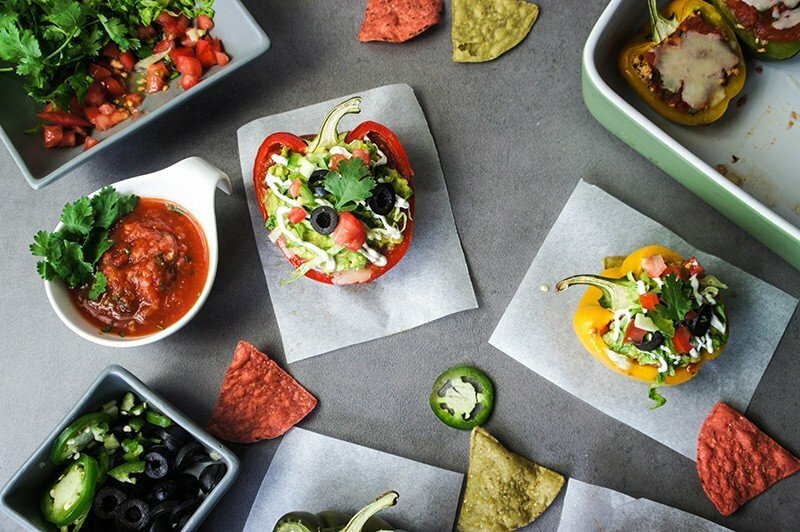 While the peppers are baking, prepare the black beans, chicken, and guacamole. Rinse and drain a can of black beans. Add them to a food processor, along with a few shakes of Tapatio (to taste) and pulse 5-7 times, until only about half of the beans are still whole. Set aside. To a skillet, add a teaspoon of olive oil, and turn on medium high heat. Add the ground chicken, and brown. When the chicken is almost cooked, add the tomato paste, water, and spices. Add more sea salt, to taste. Once the chicken is fully cooked, set aside. In a small bowl, mash the avocado. Season with lime juice, jalapeno, and sea salt, to taste. Set aside. When the bell peppers are done cooking, pull them out, and add a layer of black beans, chicken taco meat, salsa, and cheese. Cover tightly with foil. Put the peppers back in the oven, and cook for another 10-15 minutes, until the beans and chicken are heated through and the peppers are softened. Next, layer the peppers with guacamole, shredded lettuce, and sour cream. Top with tomatoes, jalapenos, olives and cilantro. I also poured quite a bit of extra salsa and Tapatio on mine! I felt these peppers really needed a bit more spice, so added quite a bit of hot sauce to the bean layer. Seasoning the peppers with sea salt before baking also helps bring out the flavor of the peppers. Do you cook for yourself when no one else is home, or do you have default easy-to-grab options like I do? Why does cleaning the kitchen for your own meal seem so much more tedious than if you’ve prepared a meal for loved ones?! This is an interesting idea for stuffing a pepper. Sounds delicious and looks pretty. I'd be making it a vegetarian version. Love the idea. Those were a really fun stuffed pepper :) Any excuse to eat more guacamole.